“Goin’ bald? Sufferin’ psychoses? Tremblin’ at things that go trump in the night? The cure is at hand! Take a daily Dvorák ‘Piano Quintet’. Lotsa different brands, but the Cassatt Quartet is as good as any. After four movements, the wilderness-world is Paradise enow”. Wherever one encounters the Cassatt Quartet, whether in the Hayden Planetarium or a barge in the East River, one is astonished both at their prowess and their unfailing inspiration. These are four players who have been together since 1985, their venues, their composers, and their daring, always a revelation. Add to the Cassatt pianist Doris Stevenson. I had only heard her previously in BargeMusic, where all five musicians played last night, but she has circumabulated both concert hall and Inuit dwellings, bringing her own virtuosity throughout America and abroad. Together they played one of the most glorious works in chamber literature, the Dvorák Piano Quintet. The four movements are so heartfelt–both in Czech feelings and the deepest late Romantic emotions–that one can feel only ecstasy throughout its 35-odd minutes. This was not Dvorák attempting to bring his homeland into more mainstream music. This was the Dvorák whose confidence (and unerring skill) created rural lyricism, sophisticated sensitivities and the most striking emotional changes. If anybody can hear the final 24 minutes, with its dancing turned into melancholy into dancing again, without experiencing a personal sensibility, one simply isn’t listening to music. It seems improbable that any skilled musicians could spoil such perfectly assembled music, and the Cassatt Quartet gave each movement the necessary warmth. The reasons were evident. 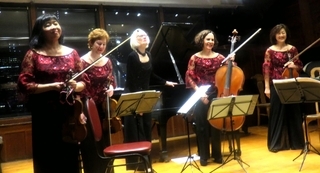 First the heartfelt partnership between pianist Stevenson and her four colleagues. I regret being sexist or ageist, but the similarity of age and gender offered a satisfying homogeneity. Second, within the confines of BargeMusic played against the twilight skyline of Manhattan (the music began at 6 a.m.), one felt that intimacy, that friendship which Dvořák himself music have felt with his fellow musicians at home in his Bohemian village. Third was flowing riverine melodic inspiration. The two short “Dumka” was never too slow, the Scherzo was not too bold. And the outer movements had a melding, a flux, indeed the music of friends. The opening measures of the Cassatt Quartet seemed a bit more doleful than usual, as if one would listen to tragedy. But with the first measures of the Allegro, their playing seemed faultless. We have all heard the Dvorák Piano Quintet played with more robust energy, with more sentimentality. And yes, that can be equally moving, equally poignant. Yet like any great music, we need no “perfect” interpretation. The Cassatt Quartet and Doris Stevenson played it at their own pace, and that was sufficient enough for our delight. This was the second work on a program which included a world premiere. When the Cassatt Quartet was formed in 1985, Zachary Wadsworth was a mere two years old, but in those decades, both the Quartet and the composer have blossomed, though Cassatt more than Wordsworth. His Piano Quintet had its “chamber-premiere” last night, just a few days after Mr. Wadsworth’s Piano Concerto, with the same soloist, Doris Stevenson at the keyboard. The composer seems quite the talented craftsman, and his work last night made for comfortable, if not even remotely exciting listening. Mr. Wadsworth is more than conservative. He is tonal, his rare dissonances meld inevitably into a tonic chord. His one measure of quarter-tones was like an aberration, quickly repaired. Yet true, his five movements were put together with the skill of a talented student. The first Largo, with its four-note piano theme, did have the solemnity of his description “Invocation”. The following tarantella was quite danceable, with a lovely viola solo. In my notes, I wrote that the fourth-movement march seemed “funereal”, and later saw in the program it was indeed a cortège. In none of these three movements, or the rondo-like finale, did one feel an emotional invention. They were not pasted together, they were carefully, efficiently put in place. The centerpiece “Cosmogony” was different. Mr. Wadsworth changed this almost retroactive tonality into modal almost medieval mood. Ms. Stevenson’s piano solo with its repeated notes was almost like a slow Scarlatti-like theme. Yet the entire movement was perhaps too calculated, too carefully constructed. One wished that Mr. Wadsworth, obviously a well-trained composer, would have lost that training for a few measures, had let himself go, to err and head off the tracks. Fortunately, the Cassatt Quartet, exploiting, performing and yes, taking chances for several decades now, played the Quintet with all their wondrous technique and respect.